Cactaceae. Zones 7-10. 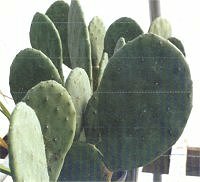 A prickly pear cactus without obtrusive spines, reaching four to five feet tall in three years. Four inch yellow flowers emerge from the pads in early summer. Drought tolerant, of course. Full sun, well-drained soil.